Preparing students for standardized exams doesn’t have to be boring or irrelevant! 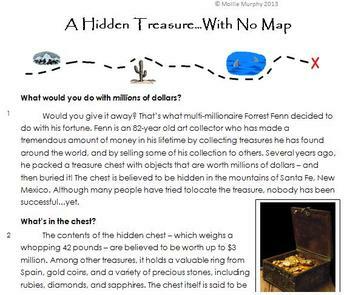 Here’s another high-interest test prep article on an engaging topic – a valuable treasure hidden somewhere in the U.S. Students will learn about Forrest Fenn, a multi-millionaire who recently hid millions of dollars worth of objects in a treasure chest and has released clues inviting curious treasure-seekers to find it. This text includes 7 multiple choice questions along with a short response question. An answer key is included. Should be accessible to 4th and 5th graders as well as fluent readers in 3rd grade.